Condition Good: Comment: Book is used and in good condition with some wear from use. This may include wear to dustcover/missing dustcover, inside cover, spine, some highlighting or writing in book, slight curled corners, stains, and wear to the fore edge. All orders ship via FedEx SmartPost. (Please note shipments to Hawaii and Puerto Rico Can take up to 30 days. ) Thank you for shopping with Goodwill Industries of the Inland Northwest-changing lives through the cycle for good. There may be stickers or sticker residue on the cover. by Dr. William R Forstchen, Ph.D.
A novel of what a economic disaster would mean to this country. Patriots is a very thought-provoking novel. Mr. Rawles is knowledgeable about what may happen during a major breakdown of American society because of his experiences and being a former intelligence officer. This book was very depressing to one of my friends who read it but not to me. Knowledge is good, even knowledge about the end of the world as we know it. Don't be depressed, be prepared. I like this book a lot. 4 1/2 stars. There were a few things I would have omitted, like the build up of the brothers. Why? just so you can mention them one time later on. Info on radios overkill. But overall a very good intro level story to prepping/ survivalism. I own five copies and recommend/lend to all I believe might be interested in a potential societal collapse. I liked the sequel to a lessor degree. Only own one copy of Survivors. this is well wrighten an shows good sence but is not a good guide for a poor man as the cost of doing it this way is quite high. though i can see the sence in it. 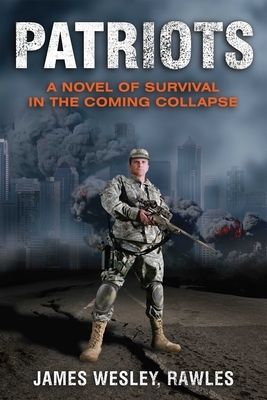 I read this book as someone who is neither a survivalist nor a conspiracy theorist, nor someone interested in weapons. What I AM interested in is the question of how modern people might survive if the normally expected parts of society (supermarkets, public transportation, gas stations, cell phones, law enforcement, etc.) were to disappear. If that is something you find interesting to have thought about and developed in some detail, this is a book for you. Yes, it is flawed, in that it is not particularly well written (the author is not a professional wordsmith), and one can argue about the merit of the political issues. Still, if you might want to think about what you might do if civil society fell apart, the author gives you well-thought-out reality therapy. He does so in a book filled with rather interesting individuals who go through rather interesting experiences.